Both Adelaide and Adeline are beautiful, classic sounding names that have been gaining popularity for the past decade in the U.S. While both quite similar looking, they are also distinct enough that it's very possible they would both appear on many people's lists. So how do you choose if you are partial to both? Well, hopefully today's Name Battle will help you do just that! Before I go into these names in depth, I'm going to add a disclaimer here. I actually lived in the Australian city of Adelaide for six years. It was where I moved to when I left home, where I went to University, where I went clubbing and where I met my husband. Both of us still have family there, so we occasionally visit. I have some fond and sentimental memories of the city, and a few no so good ones too. But it makes it very hard for me to think of it as an "exotic" destination name. You however may feel differently. While some may not care about origin or meaning, for others this can make or break a name. Meanings can carry aspirations for our children, or be a way to honour someone or something we love, while origins can be a way of honouring a particular heritage or your ancestry. Adelaide - Adelaide has quite the European heritage. She's German, originally Adalheid from the words 'adal heid', meaning 'noble kind'. She's Adelaide to the French, and you'll also see her as Adelheid for the Dutch or Adelaida for Polish. 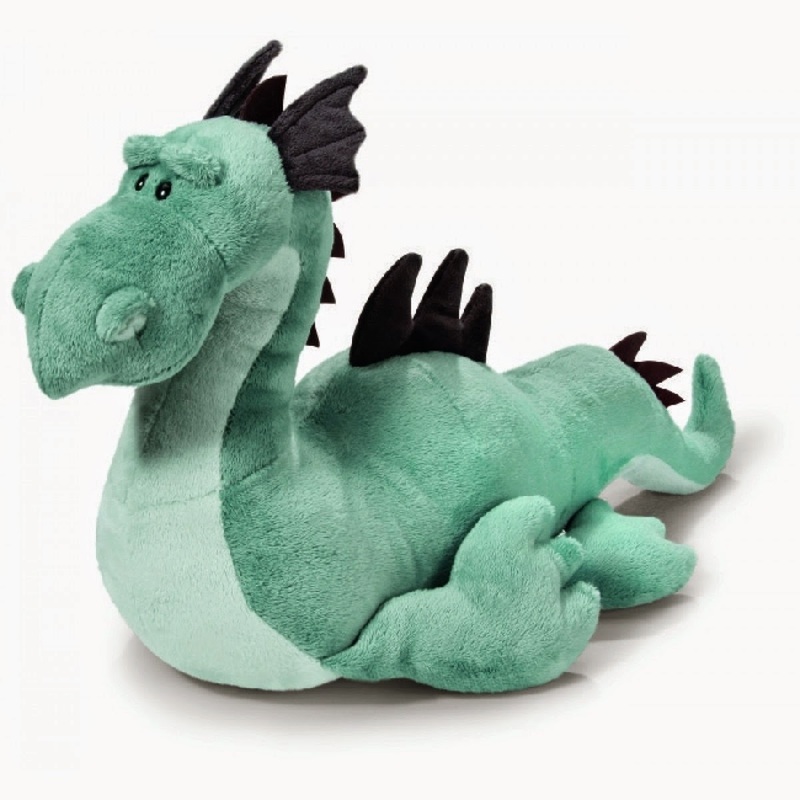 In Adelaide's original context, noble was meant to denote that someone was highborn. When I hear of noble though, I think of the alternate definition of "exalted moral or mental character or excellence; admirable in dignity of conception, manner of expression, execution, or composition". This makes me love names with a "noble" meaning. Adeline - Speaking of noble names, Anna at Waltzing More Than Matilda tells us that "Adel" names were abundant amongst the Frankish nobility as it emphasised that their daughters were high-born and hence made them better marriage prospects. With that in mind, you may have already guessed that Adeline comes from similar roots as Adelaide. Also German, she simply means 'noble'. Let's face it, this stuff matters. If for no other reason than we understand the horrified looks we get when we tell people that we have named our new bundle of joy Adolf, Alcatraz or Jezebel. Adelaide - For many Australians, Adelaide will always be a not-so-glamorous city. The city itself was named for a beloved queen. Queen Adelaide was a German princess who married King William IV of England. She was adored as a modest, charitable queen with a sympathetic record of several miscarriages and no surviving children. The city of Adelaide was founded during William's reign in 1836, however there are also many other towns, streets, buildings, monuments, rivers, places and even an asteroid named for her. Many other noteworthy Adelaides can also be found in history, song and fiction. There was a Saint Adelaide, songs by Beethoven and artists Anberlin, The Old 97's and Ben Folds; the ditsy but lovable character Miss Adelaide from the musical 'Guys and Dolls'; and Madame Adelaide of Disney film 'The Aristocats'. Contemporary examples include character Captain Adelaide Brooke on 'Doctor Who', young Australian actresses Adelaide Clemens and Adelaide Kane (who plays Mary Queen of Scots in 'Reign') and daughters of celebrities Rachel Griffiths and Katherine Heigl. Adeline - Adeline seems to be most popular in song - 'Sweet Adeline' was a barbershop quartet favourite and covered by The Seekers, and since then Weezer and Elliot Smith have also released songs with this title. Stephen Kellogg and the Sixers went with 'Oh Adeline' for one of their songs instead, and Brian Wright and Kasey Chambers both simply used 'Adeline'. Green Day owns indie record label Adeline Records, and at the other end of the spectrum there's 'Ballade Pour Adeline' or 'Ballad for Adeline', an instrumental piece. 'Sweet Adeline' is also a stage musical. Famous bearers include Virginia Woolf (who was born Adeline Virginia Stephen); Chinese-American author Adeline Yen Mah; Malaysian model and 2006 Miss Malaysia World Adeline Choo; French actress and writer Adeline Blondieau; and South African model come pop sensation Adeline Mocke. Variant spellings seem to be more popular for our screens, with Bailey Noble playing an Adilyn currently on 'True Blood'; Claire Coffee Adalind on 'Grimm' and Blake Lively due to appear as Adaline in the upcoming 'The Age of Adeline'. And let's not forget those celebrity babies - Simon Helberg's Adeline was born in 2012. Adelaide - Pronounced AD-a-layd, immediate nicknames that spring to mind are Addy or Ada. Then there's Aidy (I like this one), Dell, Della, Ads, Lady, Adele, Ley, Lainey, Leia, Elle or Ellie. Most of the ex-Adelaidians I know living in Melbourne tend to refer to Adelaide as "Radelaide" - it's an inside joke because while Adelaide is a very nice city, it's not exactly exciting or "rad". But I mention it because Rad, Rads or Radelaide would make for a pretty cool nicknames for a spunky little girl. Adeline - Adeline has a few different pronunciations, which tends to explain why there are so many spelling variants as parents try to make it clearer which pronunciation they are aiming for. The French pronounce it a-de-LEEN, while English speakers will say ADD-a-line (rhymes with fine) or ADD-a-lyn. Nicknames are almost exactly the same as one would use for Adelaide, although Lin, Linny and Lina are extra possibilities depending on which pronunciation you use. rare and will make their child stand out in a crowd. Adelaide - Adelaide is well recognised but not super popular. She's never been in the top 100 in Australia, but has gotten close in a couple of states in recent years. She has started dropping again though, possibly due to false concerns that she was getting a little "too" popular. In the U.S, more babies than ever before were named Adelaide in 2013 - 1007 to be exact - which still puts her at #321. She's been slowly rising for the past decade and could continue to climb higher. Adeline - Adelaide and Adeline have followed very similar popularity patterns in the U.S, although Adeline has consistently been the more popular of the two. She was a top 200 name at the start of the 20th century but dropped out of the top 1000 in 1954, returning in 1999. It has followed a similar path in Australia. It's hard to gauge her true popularity with so many variant spellings around now, although Kelli Brady estimates her popularity to me more like #34 (not #232) in 2013 when alternate spellings are combined. These are the things that often attract us most strongly to a name, whether consciously of unconsciously. What feelings does it evoke for you? What characteristics or traits do you envision someone with this name having? And do you like those things? Adelaide - Of the comments I've read about the name Adelaide, overwhelmingly the most common impression is that it's an elegant name. It's also described as classic, regal, beautiful, feminine, delicate, graceful and timeless. I'd like to add spunky to that list. People who don't like it tend to say it feels fussy, fusty, clunky and old lady-ish. They don't like that it has "laid" in it, or that it reminds them of lemonade, Gatorade and Powerade. Adeline - Pronunciation is a major factor here, as the most common complaint seems to be that it sounds like "add a line". Why not just use Madeline, people say. Of course, this is avoided if you're using the a-de-LEEN or ADD-a-lyn pronunciations. It also explains why most of the spelling variants seem to be aimed at emphasising the latter pronunciation - Adalynn, Adalyn and Addilyn are all more popular than Adeline is. However for that sweet, classic and old fashioned charm it's hard to go past Adeline. She's cute and peppy, a tomboy nickname that still manages to feel feminine and intelligent. Andie seems to blend in almost effortlessly. You possibly know a few and haven't given it much thought as a name. But if you take a step back and consider it for a moment, you appreciate just how pretty and stylish it is in it's simplicity. When I think of Andie, my mind immediately goes to Molly Ringwald in 'Pretty In Pink', or the sweet popular cheerleader in 80's favourite 'The Goonies' (OK, the second is actually Andy, but the sound is still there). That leaves me feeling that Andie and her variants are 80's names, but this isn't actually true. In the U.S, Andi "peaked" recently in 2012 at #1436; Andie in 1995 at #1330; Andee in 1995 at #3423; and Andy in 1959 at #2345. In comparison, for boys Andee has never charted; and Andi and Andie have regularly charted for boys but not as highly as it does for girls. And then of course Andy remains super popular for boys - it hasn't ranked less than #381 since the SSA started reporting on names in 1880. Let's chalk her popularity in 1995 up to actress Andie MacDowell. Born Rosalie Anderson MacDowell, she was extremely busy in the mid 90's. Perhaps her most memorable role was as Hugh Grants' enchanting love interest in 'Four Weddings and a Funeral'. You don't have to look very far to find plenty more examples since then. On TV we saw character Andie McPhee on 'Dawson's Creek' from 1998 to 2003, played by Meredith Monroe; and from 2007 to 2009 Missy Peregrim played Andi Prendergast on 'Reaper'. In movies Kate Hudson played main character Andie Anderson in 2003's 'How to Lose a Guy in 10 Days'; 2008 saw Briana Evigan play lead Andie in 'Step Up 2: The Streets'; and Emma Roberts starred as Andi in the family movie 'Hotel for Dogs' in 2009. Real life examples include Phillipine actress Andi Eigenmann, model Andie Arthur, and Victoria Secret model Andi Muise. And the latest Andi to make headlines is Andi Dorfman, current star of 'The Bachelorette' who famously walked out on 'The Bachelor' Juan Pablo Galavis for being selfish, sexist and boring. What do you think - is Andie able to stand on her own, or would you use a longer name? What impressions do you have of Andie? Or even Andi? Have the perfect first name, but scratching your head trying to think of an awesome middle name? 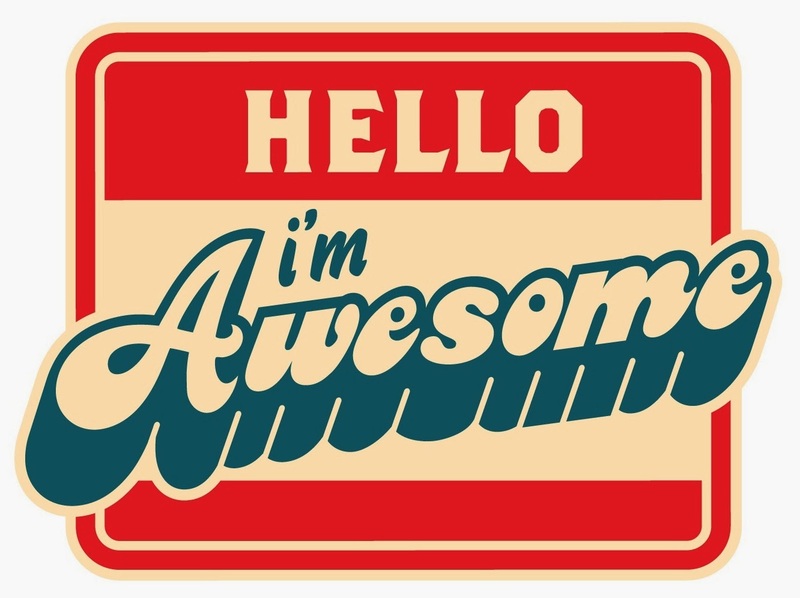 Well, how about just using Awesome? One mother is Juneau is hoping to do just that. No, it's not intended as a pun name. It's actually quite a sweet story, and worth checking out. The original story is here. Believe it or not, Awesome charted as a first name for boys in 2010 (6 boys), 2011 (7 boys) and 2012 (6 boys). Personally I think using it as a middle is cool and funky, but it feels a little over inflated as a first name. But then again, similar names that have charted include King, Queen, Prince, Princess, Major, Regal, Majesty, Majestic, Marvel, Star, Glorious, Great, Beautiful, Brilliant, Divine, Champion, Boss, Epic, Legend and Royal (here's looking at you Lil' Kim). It's enough to make Awesome seem almost modest in comparison! Every day on my tram ride into work, I pass by a big house with the name Penryn emblazoned on it. But it wasn't until recently that it struck me what a nice name Penryn would make. Penryn is a real rarity, but feels incredibly name-worthy. Maybe because I've seen Penn and Penna getting some love in recent years. Or maybe because it sounds a little like a vintage-y, fantasy-like substitute for Lauren/Loren. Either way, I can see this working equally well on a person of either gender. Penryn is in fact a place name in Cornwall, England - a quiet town called Penryn that is located on the Penryn River. It comes from the Cornish Pennrynn, meaning 'promontory' or 'headland'. Which gives it a bit of a nature and water/earth reference. There's also a small town named Penryn in the U.S, or there's Penrhyn Castle in Wales, which is the Welsh spelling of this word. And Penryn is also a technological name, as the code name of a processor sold by Intel from 2007-2011. Funnily enough, my research into Penryn tells me that I was not the first to think Penryn would be a great name for a character in a science fiction/fantasy story. Author Susan Ee has used it for the name of the central female character in her series known as 'Penryn and the End of Days'. The author relates in an interview with Entertainment Weekly that the inspiration for her name came from an exit sign off the I-80 in California, showing that good inspiration truly can come from anywhere. I like her style - the main male character bears the very cool moniker Raffe. I haven't read the books myself (having only just found out about them), but the first one titled 'Angelfall' was released in 2011 and has rave reviews on GoodReads, as does the 2013 follow up 'World After'. It may be yet another YA dystopian post apocalyptic series, but I have a real weakness for those, so will definitely have to check them out myself! When I'm finished reading the current 'Dresden Files' book, that is. Seems the author Susan Ee is already in talks with Sam Raimi (! ), Rob Tapert and Good Universe to make 'Angelfall' into a film, so we may hear Penryn a lot more in the next few years. Luckily it feels much more wearable than Katniss. What initially drew me to Penryn is that is feels like a strong, vaguely aristocratic and preppy name. Yet the second syllable lends it some softness too - I'd assume that it's pronounced PEN-rin. For a girl I could see it being a fresh and spunky alternative to Kathryn, Karen or Lauren; or maybe even Penelope if you're worried about how popular Penelope has become in recent years. 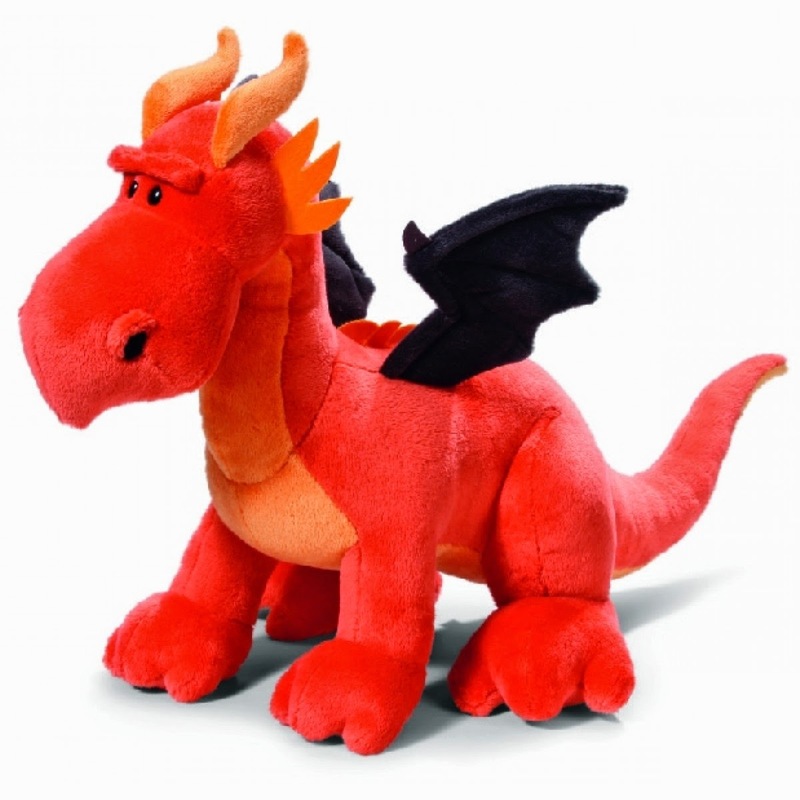 Nicknames could be Penny, Pen, Rin or Rynn, the last few of which could also work well for a boy. And wouldn't it be great for a boy? It's like an (even more) stately Henry or Peregrine, and brings to mind names such as August, Jasper, Teague or Riordan, which have a similar vibe. Penryn has never charted in the U.S, and seems to be quite rare in other parts of the world too. If you can also recognise the charm this name has, Penryn may be the rarity you have been looking for. What do you think? Penryn - Yay or Nay? I was feeling a bit nostalgic so watched a few episodes of 'Punky Brewster' today for a fun blast from the past. If you were alive in the 80's then it's likely that you know the TV show I'm talking about. It's about a little girl named Punky who was homeless and squatting in a vacant apartment until she was discovered by the building manager Henry Warnimont, a somewhat crotchety elder man with no family of his own. Punky takes an instant liking to the belligerent Henry, but he takes a little longer to warm to Punky. Initially, he contacts Family Services in an attempt to find her mother, but when she can't be found he fights for custody himself rather than have Punky placed with a foster family. Fun and hi-jinks ensue as these two mis-matched loners adjust to life together. 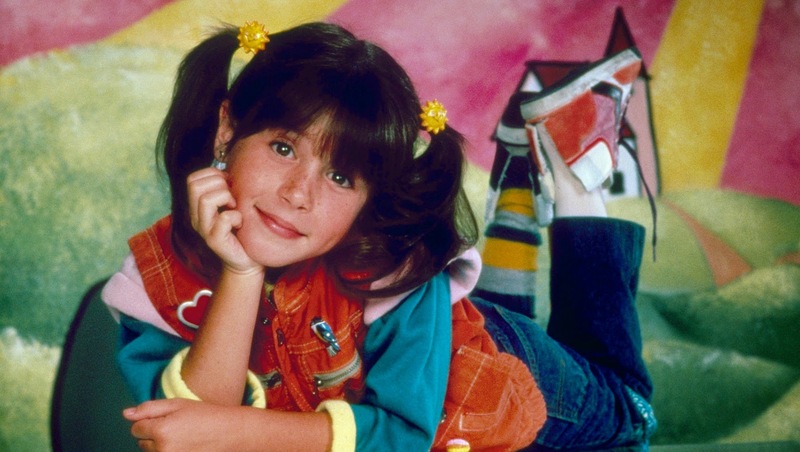 The show wasn't a huge ratings winner, but 'Punky Brewster' was very popular with kids during its' run from 1984 to 1988, and made child star Soleil Moon Frye a household name. Yes, that's the same Soleil who now has her own children, the fabulously named Poet Sienna Rose, Jagger Joseph Blue and Lyric Sonny Roads. But on to todays' quote. I loved this conversation between Punky and social worker Randi Mitchell in the second episode. Randi: Do you have a real name besides Punky? Randi: Yes I know, and it's a very nice one, but don't you have another name? Punky: Miranda! Miranda's worse than Penelope! I loved the show, but could not have told you that Punky was short for Penelope! It also illustrates just how much our opinions of names can change in 30 years. When this episode aired in 1984, Penelope was way outside the U.S top 1000, as she had been for the previous 8 years and would remain for the next 16 years. You can see how Miss Brewster would have been less than impressed with her formal name, one that would have seemed uncool and "old lady-like" in the 80's. Now it's a different story though. Penelope has been shooting up the charts, entering the top 100 for the first time in 2013 (Punky however has yet to ever chart). Miranda on the other hand has remained a top 1000 name for a long time, declining slightly in the last few years. I'm not sure why it would have seemed so laughable as a name in the 1984, when it was hovering just outside the top 100. On a final note, wouldn't Penelope and Miranda now make for fantastic sisters? Less so Punky (which now feels dated and too tied to the one character) and Randi (which has not-so-great connotations for a little girl), although both are quite sassy, boisterous names for their classical counterparts. In today's naming climate I have a feeling that Penelope and Miranda wouldn't feel ashamed of their beautiful names at all. 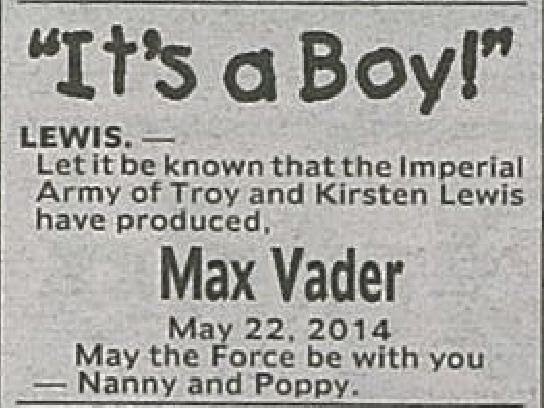 Between the above recent birth notice, and this one for Fenris Leander from February, I'm starting to get the impression that Star Wars fans write some of the most creative and fun birth announcements! For many people Max Vader is a combination that covers many parents wish lists for a name. The first name is a familiar, well liked classic, plus it has the macho "X" ending that is so hot right now. Max fits in perfectly without trying too hard. Then you have Vader - unexpected and adventurous, with (I assume) personal meaning for the parents. It's a serious face to the world with a hidden cheeky quirkiness, and all in all it's a pretty cool combination. I was sure I had covered Max (or more specifically, Maxwell) here at Baby Name Pondering before, because it's a name that is near and dear to my heart, but I haven't. My maternal grandfather was a Maxwell that went by Max, hence my attachment. Max is a Latin name meaning 'greatest', which also helps boost it's appeal. I still remember when Homer renamed himself Max Power in one episode of 'The Simpsons', and boy did that new name give him swagger! Other examples of real life and fictional Max's are plentiful, with one of the most popular being the young main character in the book and movie 'Where the Wild Things Are'. This has helped to make Max a very popular name in many countries. In 2013, Max was #17 here in Australia, #24 in New Zealand, #14 in Germany, #15 in The Netherlands, #18 in Scotland, #36 in Sweden and #111 in the U.S. Other popular variations internationally include Maxim (#1 in Belarus & Moldova, #3 in Russia), Maximilian (#9 in Germany) and Maxime (#57 in Canada). Max is definitely a name that travels and wears well. Of course, the noteworthy part of this name is Vader, a name that will forever be undeniably associated with 'Star Wars'. For those uninitiated to the world of 'Star Wars', Darth Vader is the villain at the center of the original three movies (now technically movies 3,4 & 5). The three prequels were made to introduce his back story, chronicling his fall from promising young Jedi student to master of the dark side. There are a few theories as to where this characters name came from, and it's very likely that all are just as true as each other, as creator George Lucas often takes a very considered view to naming important characters. The prevalent one is that Darth is a play on 'dark Sith' or simply 'dark', with Vader being the Dutch word for 'father' - although the pronunciation of VEY-der used in the movies is supposedly closer to the way the Germans pronounce their word for 'father', vater. This is the favoured explanation because the big reveal of the original trilogy is that he is in fact, hero Luke's father. Other explanations are based on the word play thought to be behind Darth. Vader may be a play on the word 'invader', which tends to have evil overlord connotations in itself. George Lucas has also said in interviews that he likes that the combination of Darth Vader sounds like both 'dark father' and 'death water'. So why would someone want to choose the name of an evil character that The American Film Institute has listed as the third greatest movie villain in cinema history for their young child? Well, it helps a lot that Darth Vader is a fictional villain. His crimes aren't real to us, and we have three movies of back story to make him a more sympathetic character. Then consider that many of his traits are actually highly valued by our society. The tenacity to make hard decisions and stick to them, eliminating threats that stand in the way of reaching goals. And Darth Vader even gets his own super cool theme song. It's kind of like the ultimate user friendly bad boy name. At the same time though, it's still too associated with the one reference to be a highly desirable first name. The only time it has charted in the U.S was in 2012. Well, other than in the early 1900's, when it charted a handful of times for girls; most likely as a spelling variation of Vada or Vida. Which is why Vader works so well as a middle name. It's a great combination, one that should this boy well. Welcome to the world Max Vader!